A Limited Liability Company, or LLC, is a type of legal business structure that creates an entity separate from the business owner(s). Whereas in a sole proprietorship, the owner and the business are viewed as one and the same, an LLC creates a business separate from the owner. The primary benefit in forming an LLC in your home business is that you, and any members of your business, are protected from personal liability. That means if your business is sued, plaintiffs can only go after your business assets and not your personal ones, such as your home. Another benefit is that profits and losses can pass directly to the members without the LLC entity being taxed separately, just as with a partnership. Owners of an LLC are referred to as "members," similar to a corporation. There can be an unlimited number of members in an LLC company. Most states now allow for single-member LLCs, which are owned and operated by one person, such as a home business owner. The LLC company can be managed directly by its members or the members can designate a manager. Most states now allow single-person LLCs, which means there is only one member. All LLCs (single or multi-member), need to designate a registered agent, who is responsible for receiving any legal documents on behalf of the LLC. In most cases, the registered agent can be the business owner (manager) as long as the designated person is located within the same state in which the LLC is established. An LLC is easier and usually less expensive to establish than a full (C) corporation. Unlike both C and S corporations, annual meetings are not required to be held by its members, unless it is stated they will be held in the LLC documents. There are several ways an LLC can file taxes. Single-member LLCs are considered disregarded entities by the IRS and are taxed as a sole proprietorship using Schedule C. In a partnership or multi-member LLC, the IRS taxes members, not the business unless the LLC files tax form 2243 to request to file as an S-Corp. In this case, the business would need to file taxes and the members would treat their LLC income like regular income on their 1040. The Small Business Administration offers help on deciding if you should file as a basic LLC or an S-Corp.
You can create an LLC on your own or hire a lawyer or legal firm to do the paperwork for you. Always be sure to work with a reputable attorney or agency. Create a business name for your business. Most states require that "Limited Liability Company" or "LLC" be included in the business name. Further, you'll want to check that your business name choice isn't already used in your state or trademarked. File Your Articles of Organization. Some states call it Certificate of Organization or Certificate of Formation. Most states offer a form you can fill out that includes the LLCs name, address, and often the members' names. Most will also ask for a registered agent's name and address. The registered agent is the designated person to deal with legal papers. This person needs to live in the same state as the LLC is located. If you're forming a single-person LLC, this person would be you. If you live outside of the state you want to file in, you'll need to use an LLC service that has an office in that state. Pay your filing fee. When you file your Articles of Organization, your state will require a fee, usually between $100 and $800. This fee is separate from any fee you pay a lawyer or other service to set up your LLC. Create an operating agreement. 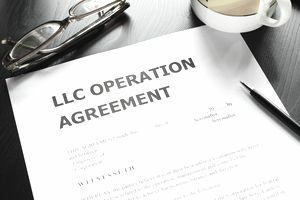 In most cases, you don't need to create or file an operating agreement to form an LLC, but many experts recommend creating one, especially if you have more than one member in your LLC. The operating agreement outlines membership details such as each members' percentage of interest in the business, members' rights and responsibilities, how the LLC will be managed, how profits and losses are allocated, and what happens to the LLC if a member wants to leave, becomes disabled, or dies. Publish a notice about the forming of your LLC. Not all states require this, but many ask that you publish a notice in your local paper announcing the formation of your LLC. You may also be asked to furnish proof that you've published the notice. Obtain any further licenses or permits. Once your LLC is formed, you can then obtain your business license and any other permits required by your state, county, or city to do business. These licenses and permits will be in your business name. You should also open a business bank account in your LLC's name.